One of the problems we face at Hackerfarm is the need to constantly water seedlings and container plants, especially in summer. Plants that are in the ground can survive for days, weeks, or even months without being irrigated because they can call upon a vast reservoir of moisture below the surface of the soil. Not so with container plants which are limited in the amount of water they can hold. It depends on the size of the container and the type of soil inside. 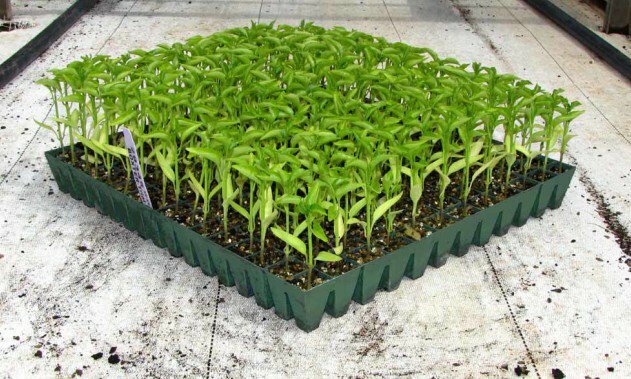 Seedlings especially are often in very small trays and need to be constantly watered to maintain moisture. Otherwise, they dry out quickly and could potentially damage the burgeoning plants. This problem is compounded by the fact that many of us travel regularly and can’t always care for seedlings. Rather than adjusting our travel schedule around when we germinate seedlings, we decided to automate the care of our seedlings by designing a solar powered, water pump based irrigation system. 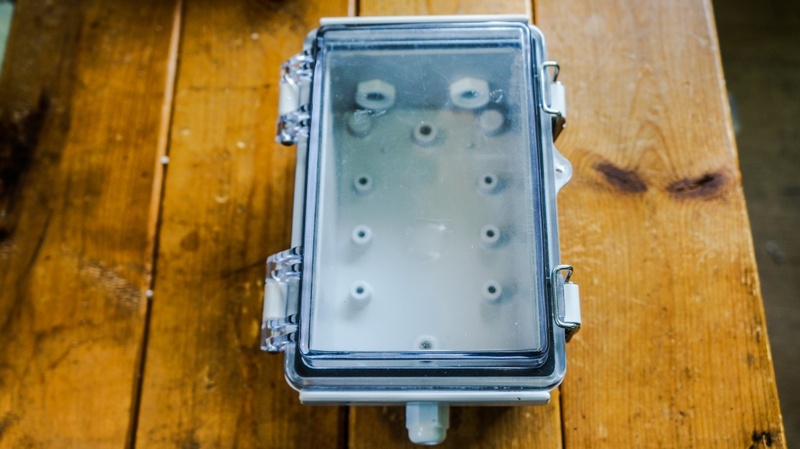 This allows us to skip a few days or even a week when we have quick trips to Tokyo or make it easier for other people to take care of the seedlings by only filling up a water container periodically. 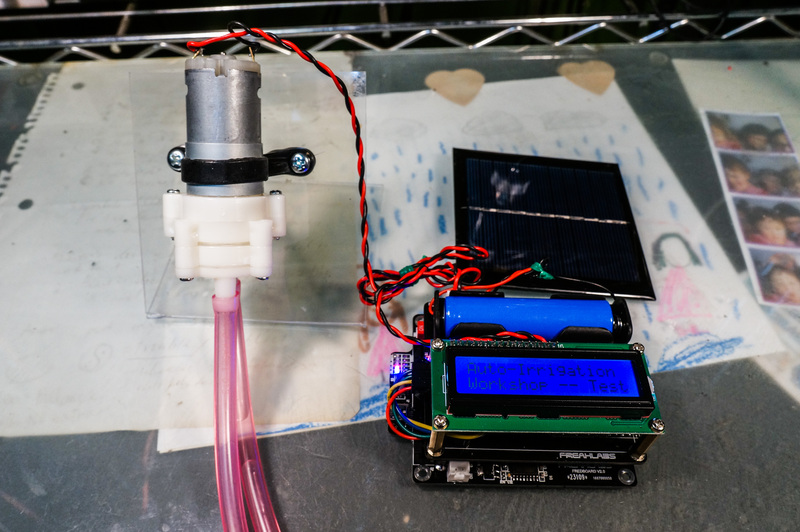 The features for the system will be that it is solar rechargeable with a lithium-ion rechargeable battery, can output 12V to control a small water pump, has a clock with alarms on it for timed irrigation, and has wireless communications to confirm when the pumps turn on and off remotely to a server. That way, we’d be able to check from the internet if the pumps are working properly or if there is anything that looks suspicious and have a friend check it out right away. Here is a shot of an early prototype version of the system. 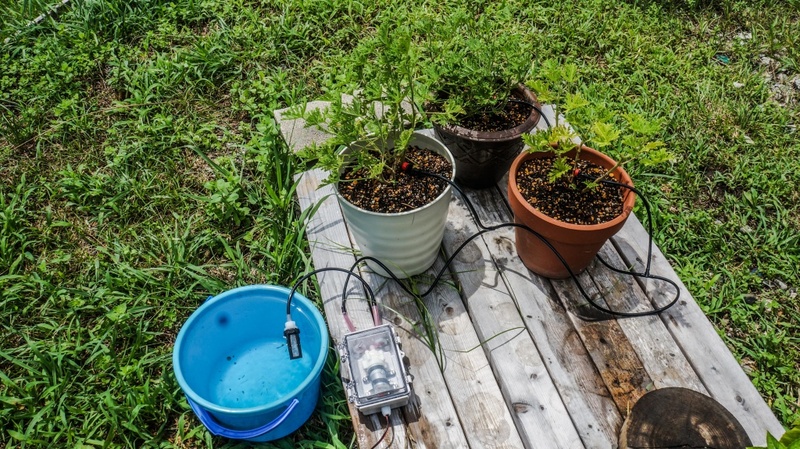 In this first part of the Hackerfarm Naiad Wireless Automated Irrigation system, I’ll be talking about setting up the tubing, emitters, and water pump to get the water to the plants. In part 2, I’ll go into more of the technical details of the Naiad system. The first requirement of the system is that it has to be relatively inexpensive. 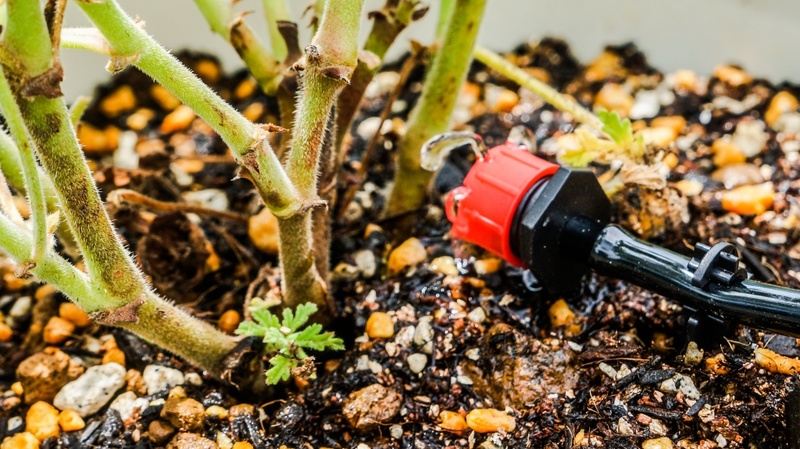 There are plenty of automated irrigation solutions, but they often cost a lot of money and we may potentially need a lot of them if we try to completely automate our greenhouses. In that case, we decided to go with standard polyethylene (PE) tubing. The black PE tubing comes in standard sizes and we used 4/7 mm (inner/outer diameter) which is good for micro drip irrigation systems. This particular type of tubing is also UV stabilized which means it won’t become brittle and fail after constant exposure to sunlight, a very important feature for us. 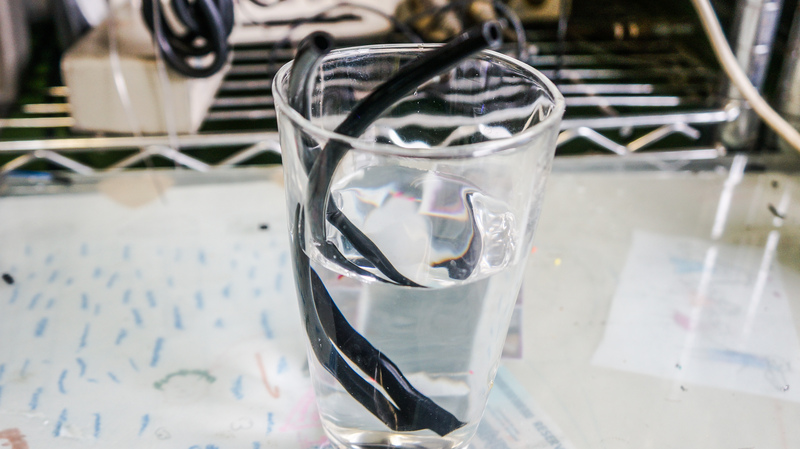 To work with this type of tubing, you often need to place it in a cup of hot water to soften the tubing up. This makes it easier to slide on to the fittings. 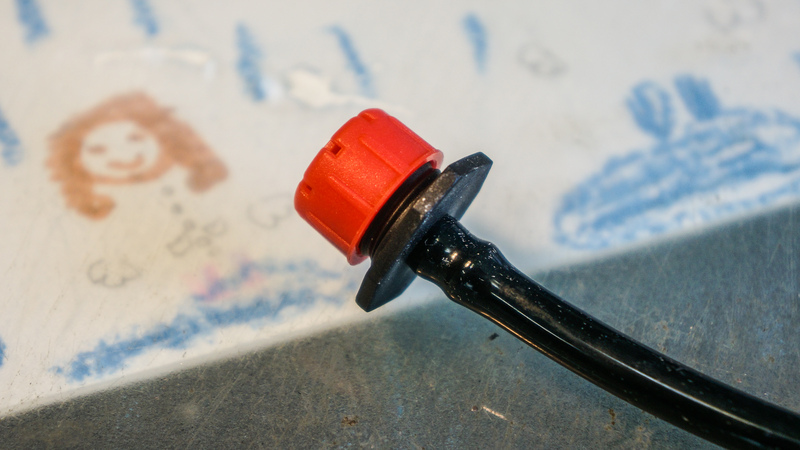 We also went with inexpensive, adjustable drip emitters that can go from 0.01 to 1.0 L/minute. It doesn’t need to be super precise but want to soak the containers or seedling trays enough that the soil stays moist. Another factor to consider is that soaking them faster is actually better for our system since it will be battery powered. The longer the pump is on, the more it will drain the battery. After soaking the PE tubing in hot water, it becomes pliable which makes it easier to fit over the emitter tube fitting. Once the tubing cools down, it shrinks slightly and forms a strong connection to the emitter. We then added tee-fittings and connected the hose together to form a chain of three emitters. This chain will irrigate three container plants as a test run. We connected the start of the chain to the water pump on the outlet side and on the inlet side, we also connected the PE tubing to a screened filter. This prevents debris inside the bucket from getting into the pump and jamming it. 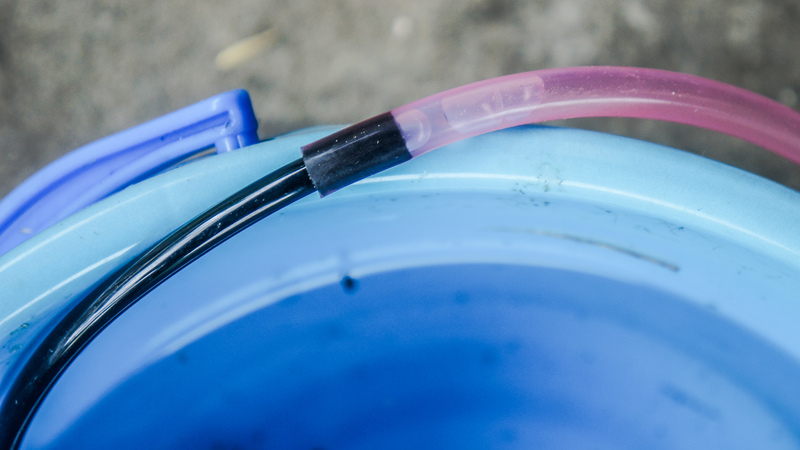 One gotcha that you have to watch out for is that when you start pumping water from a bucket, or any water source, you create a siphon effect. This is how gravity feed irrigation systems work where once you start the water flowing, vacuum suction and gravity take over and continues to push water through the tubing. Once you turn off the pump, you expect the water to stop which means you have to prevent the siphon effect. 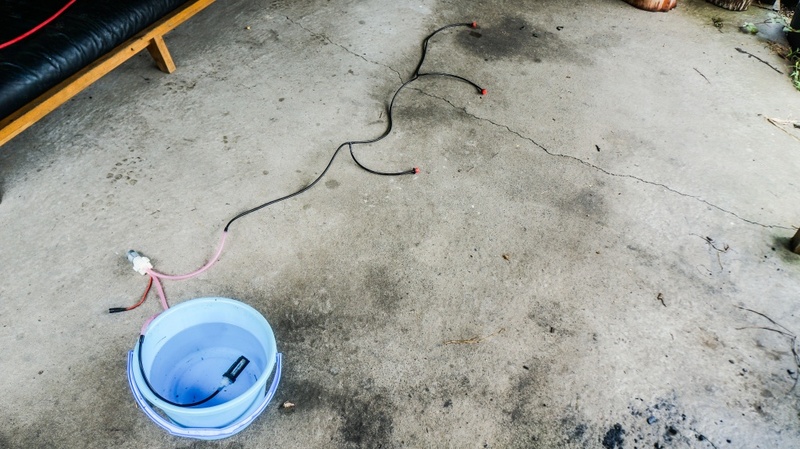 To do this, you have to let air into the hose. The best way to do this is to use a pin and put a few pin-prick holes into the tubing near the water inlet. 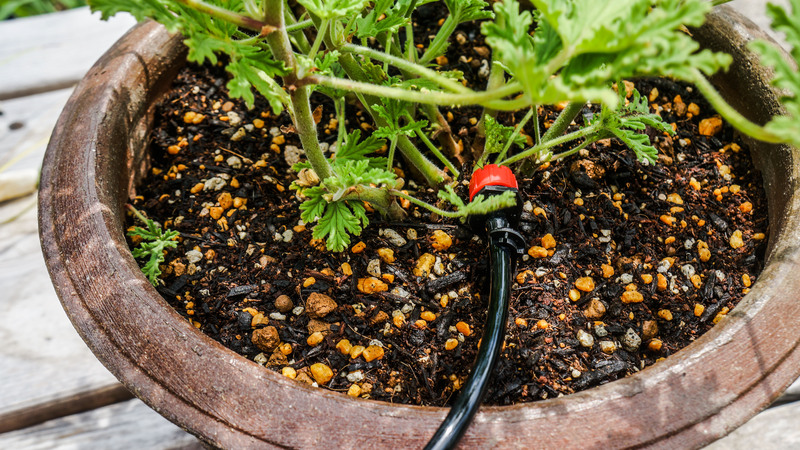 This allows air into the hose and although it makes the pump work a bit harder, it also prevents the irrigation to continue flowing even when the pump is stopped. You can see the air bubbles in the hose below from the pin pricks I put into the tube. Once we had the tubing and irrigation setup going, we had to put together a ruggedized enclosure for the water pump. The first thing we did was get an IP65, NEMA 4 enclosure which are industrial grade, waterproof enclosures. We also put together a small fitted mounting plate for the enclosure to hold the pump. 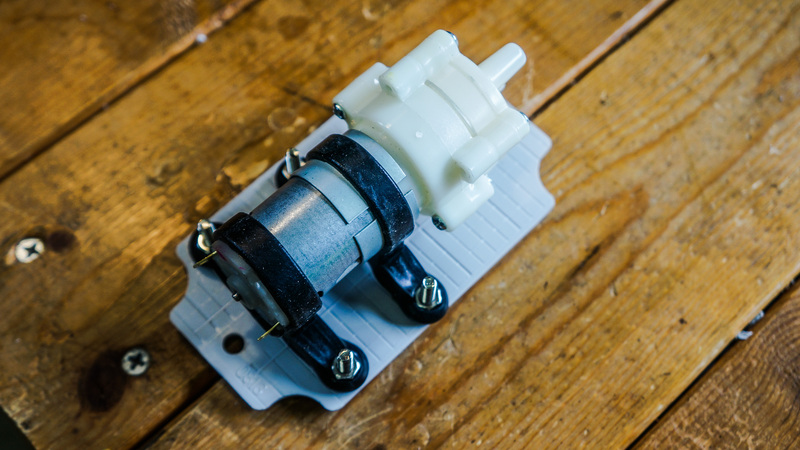 We used two rubber mounting brackets for the pump which are pliable enough to handle and absorb some of the vibration of the pump. This prevents the mounting bolts from loosening over time. By the way, these mounting plates come with the pump. We drilled out the enclosure to add waterproof cable glands that allow us to bring cables into and out of the enclosure. In this case, we only need one cable which will provide our power. The other two cable glands are actually used to pass the water hoses into the enclosure and to the pump. 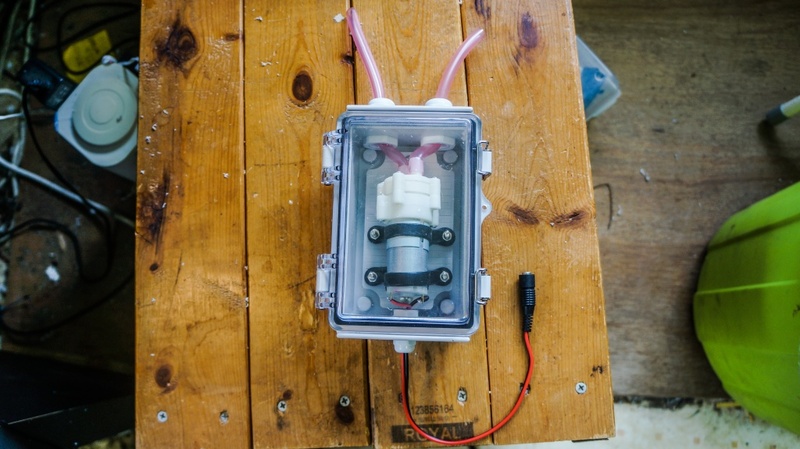 Once the enclosure was machined properly, we added in the mounting plate, soldered the power connectors to the pump, fit the tubing to the inlet and outlet ports of the pump, and then closed it up. It was now waterproof which is a bit ironic since it’s a water pump. The main purpose is that since it’s not a submersible pump, we can protect the pump from damage from the elements and corrosion on the power connections. Now that the water pump enclosure was done, we could start installing the drip irrigation on to the plant containers. We’ll be using these emitter hooks that are fitted specifically to hold 4/7 mm PE tubing. 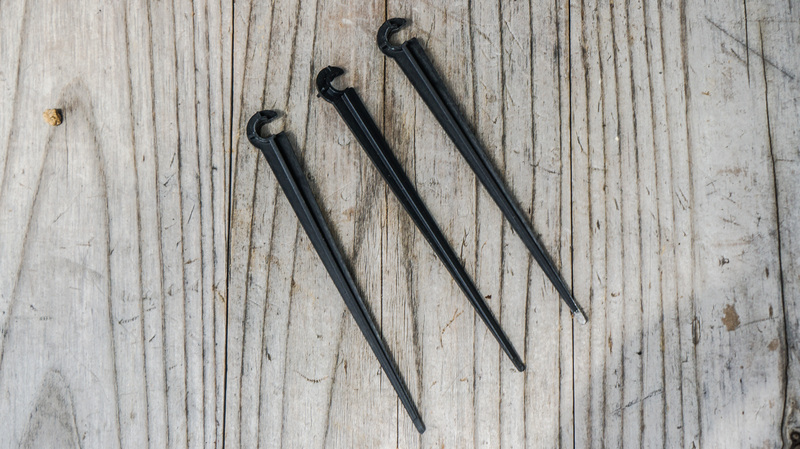 They have a sharp spike on the end that we stake into the pot and holds the emitter in place. Once we installed the hooks, we just slide the tubing into it and position the emitter as close to the base of the plant as possible. We just want to drip the water into the plant base for a specified time so that it can maintain its moisture level. We have to do that with all three plants. In this case, we’re dripping the water into our citronella plants that we’ll be cultivating for next year. We’ll be bringing these plants to seed and stocking the Hackerfarm Seed Bank with them. Citronella plants are amazingly effective at driving away mosquitoes which is why people burn citronella candles or put on citronella creams during the summer. However we’ve found that having just a few of these plants around has reduced our mosquito populations tremendously, to the point where we can leave out buckets of water and not find any mosquito larvae in them weeks later. Here’s a shot of the water pump test run with the irrigation system. The emitters are working properly and dripping the water into the plant base as expected. The main part of the system is working well and the water distribution is getting to all of the plants.